Discover the magic of Maui from ‘Coconut Cottage,’ a private family home bordering Wailea in south Kihei, 5 minutes from Keawakapu Beach! Swim with the sea turtles during the day and watch the sunset over the ocean from your lanai at dusk. Fully remodeled, this 3-bed, 2.5-bath vacation rental treats 6 to an incredible island getaway. From the pristine shores primed for surfing and snorkeling to the local shopping areas brimming with boutiques, this secluded-yet-convenient location can’t be beat! Four stately King Palms welcome you to ‘Coconut Cottage,’ nestled at the end of a quiet cul-de-sac in sunny southern Kihei on the island of Maui. Recently renovated, the interior is clean and modern, while still offering the island atmosphere of Hawaii through exposed beam ceilings and tropical furnishings. 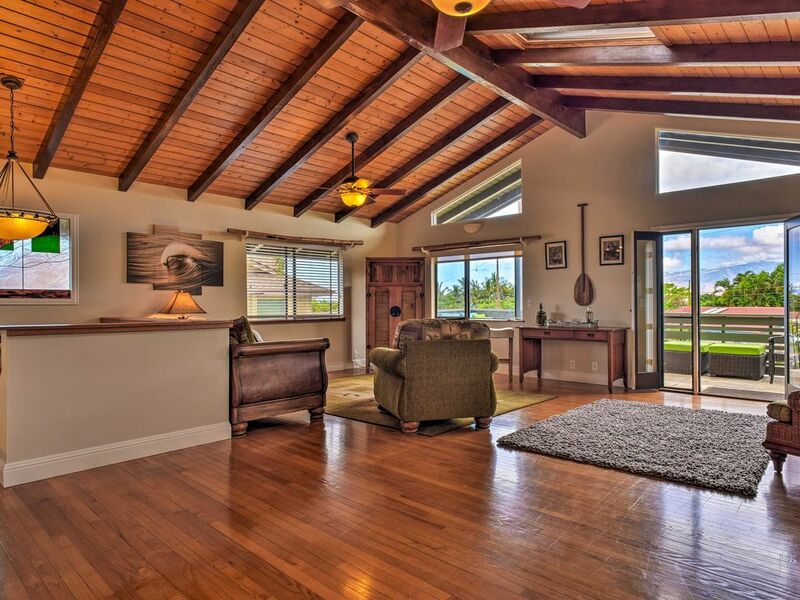 When you’re not out combing the shores of Keawakapu Beach, seek shelter from the sun in the open and airy great room, housing all of your essential comforts. Gentle trade winds blow as you settle down in front of the flat-screen TV with a Roku device for some R&R, or get lunch started in the fully equipped kitchen using fresh ingredients from nearby Kula Country Farms. If barbecue is more your taste, head around back to take advantage of the gas grill. Colorful flora and verdant greenery surround this beautifully landscaped outdoor space, serving as your personal slice of tropical paradise! Watch the sunset over the ocean from your private viewing perch on one of the home’s furnished lanais. Come bedtime, choose between 3 carpeted bedrooms, each of which is air conditioned for a cool and comfortable slumber. The beds are fitted with 400 thread count cotton sheets and cozy mattresses. The master bedroom stands apart with a king bed, full en-suite bathroom and spacious walk-in closet also has direct access to the garden with a private sliding door and outside seating. Only a short stroll from local boutiques, restaurants and beaches, ‘Coconut Cottage’ is your one-stop-shop for island adventure. Walk down to the shores of Keawakapu Beach or get there in no time with a quick drive. The area offers convenient beach access, free off-street shaded parking and fresh water showers after a day at the beach. Enjoy surfing, paddle boarding, scuba diving, snorkeling or just long walks along one of the most beautiful beaches in the world! Check out Maalaea Bay about 10 minutes away. Visit the famous Maui Aquarium, embark on a whale watching expedition, charter a fishing boat or meet the marine life with a snorkel trip around Molokini. Explore the island with a drive to exotic Hana or watch the sunrise at the top of the Haleakala. Family friendly activities include hikes into the Iao Valley, ziplining, downhill bike riding, or exploring trendy Hawaiian villages and farm communities. Trade your water gear for a set of clubs and visit one of the local golf courses, including the Emerald and Wailea Blue Golf Course. After an afternoon on the green, take the night off from cooking and explore the many and varied restaurants within 5 minutes of the property. This is a great place and we had a lovely holiday. It was very clean and welcoming and the air conditioned bedrooms were very comfortable. We had some issues with the Wifi due to the cable company and Marc did his best to make sure we were ok. Overall a great place and I would recommend a holiday here. It is a beautiful home. Very clean, and welcoming. Fabulous location as well. We had a wonderful stay at Coconut Cottage. We will definitely be back. The hosts are extremely accommodating and took every measure to ensure we had a comfortable visit. The home itself is well taken care of and well stocked for visitors. The kitchen has the necessary tools for cooking. We were very happy with the generous amount of beach toys. The yard is well groomed and lovely for relaxing in. The neighborhood is very nice as well. I think this may be the best rental home we’ve stayed in- cleanliness, location, design, hosts- everything was 10/10. We are a family of (5) including (3) teenage boys....1st floor has all the bedrooms (3) and (2) bathrooms with the 2nd floor being the open air hang out area/dining/kitchen/bathroom.....it was perfect since each bedroom (1 has 2 single beds, 1 has a double and the 3rd has a king with it's own bathroom) had its own A/C unit (keep the doors closed) and the 2nd floor had ceiling fans that moved the cross wind throughout, very comfortable. TV provided access to Netflix/Hulu and other streaming content which helped keep the boys interested in whatever down time we had along with the wi-fi access throughout the home. Perfect Vacation Home for Families! This home is located in a peaceful neighborhood a few blocks from a stunning beach for swimming and snorkeling. It was so nice to have a peaceful home to rest and reset for another day of adventures. Not only did it have basic supplies, (microwave, washer dryer, shampoo etc,) but they also provide a blender, lego, board games, beach towels and snorkel gear. Marc was a fabulous host and was always very quick in responding to any questions during our entire stay. As a family of 6, it was so nice to have plenty of indoor and outdoor options for sitting areas to read a book or rest. We loved this home and would highly recommend it to any friends or families traveling to Maui! My family and I had the pleasure of staying at the Coconut Cottage this past November. This was our first time staying in a home in Hawaii, as we had used condos for our previous trips, and I can definitely say that after staying here, I can definitely say we'll probably continue to stay in homes in the future. The house is very well furnished with all of the amenities that you would expect to have in a home, and had ample space for us to spread out in after coming back from days at the beach or hiking in Hana. The bedrooms were very comfortable, and each had an air conditioning unit which was nice after being out in the hot Maui weather during the day. I especially liked the high ceilings in the upstairs area, which was a nice change from the cramped quarters of a condo. Marc, the owner of the house, was a fantastic host, and was very responsive when we had questions about the home. He actually gave me a call the first night we arrived to make sure everything was going smoothly, and was available via email and by phone when we needed to reach him during our stay. - Patio out front was awesome! The only thing that I can think of to improve the experience would be to have air conditioning in the upstairs area. We had the ceiling fan running, but it still gets pretty hot up there! Oh yeah and a regular coffee maker would have been nice, there's only a Keurig so we had to buy K cups. Thanks for having us Marc, and hopefully we'll be back to stay again!! Big breezy living common room. Cool comfortable bedrooms. Quiet neighbourhood. Close to the beach.